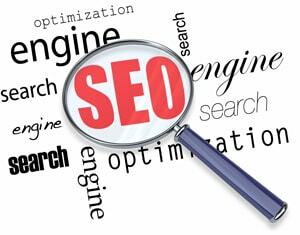 Search engine optimization (SEO) is the process of improving the visibility of a website or a web page in search engines via organic or algorithmic search results. The higher ranked on the search results page the more frequently a site appears in the search results list, the more visitors it will receive from the search engine’s users. That does seem fair to a new website that would satisfy the searcher with more relevant content! Many studies point out that many users don’t even click beyond the first page. That’s why you need to make sure your website is optimized for search. So how do you get on the first page of results? Keywords are important because the better you understand the words that people are using to find your products in your market the more you can use those same words in other forms of marketing. Keywords are the building blocks of any online marketing strategy and they also provide market intelligence and information to even help you with your off-line marketing. Search engine optimization may target different kinds of search, including image search, local search, video search, academic search, news search and industry-specific vertical search engines. The majority of web traffic is driven by the major commercial search engines, Google, Bing, and Yahoo!. They have primary search results, where web pages and other content such as videos or local listings are shown and ranked based on what the search engine considers most relevant to searcher. Although social media and other types of traffic can generate visits to your website, search engines are the primary method of navigation for most Internet searchers. This is true whether your site provides content, services, products, information, or just about anything else. Search engine optimization is about building websites that are both people and search engine-friendly. These on-page factors can only help optimize your website to a certain point. That’s where off-page tactics can help you increase your SEO. These include Facebook, Twitter, blog posts or product review sites. Off-page tactics, also known as backlinks can be difficult to control, but they can play a bigger role. SEO results are not immediate or final. Your ranking can go up or down on a weekly or even a daily basis. The process is ongoing and needs constant measuring and monitoring. Google’s job is to find relevant website results and the best you can do is to provide quality content that is easy to navigate. Lastly, Google Adwords can help you buy your way to the top. Use a niche keyword to build traffic to your website. Get started today. Contact us to learn how we can make your website optimized for search.